Pump jacks make siding installation much safer and productive. One of our crews recently installed James HardiPlank Lap Siding on a three story addition for a private school with the assistance of pump jacks. You can buy pump jacks from most building supply companies and some online specialty stores. As you can see in the photo above we were using the pump jacks to access a portion of the building that was 30 feet in the air. Two men can work comfortably from the long span OSHA approved plank system. The big key is being sure that you or your crew are using all the safety devices. Most pump jack systems come with safety netting, back scaffolding planks, etc to prevent falls and dropped equipment. It’s also VERY important to follow maximum working loads including people, tools and materials. Using pump jacks has drastically improved our safety and production. Workers feel much more secure while being able to move about more freely. If you don’t use pump jacks you really should consider them. Some rental centers also rent them so that’s an option for home owners looking for a safer way to work on their homes. Just thought I’d point out that the photo doesn’t appear to show toe boards and mid rails (or a net) so I don’t think that the set up as shown is in compliance with OSHA regs. Mark – Actually OSHA allows this set-up because the distance between platforms is only about 24″ (http://www.osha.gov/SLTC/pptpresentations/pumpjack_0398/slides/slide14.html). Also, no toe boards are required in this set-up, again per OSHA site and the pump jack manufactures site. The net is missing because the workers are finished using it and preparing to take it down. The nets are not specifically required. They only give guidelines for them if you choose to use them. Obviously the nets are quite important especially to protect against falling debris. Just to be clear, toe boards are not required IF there is a safety net in place, right? So basically you can follow either criteria and be within the limits of the regulation. You don’t put two 24′ together! Not designed for that. According to Alum-A-Pole’s website, these pole jacks are OSHA approved to be used at up to a 50′ shoulder work height. Which would include combining 2 24′ poles, as stated above. There are instructions on their website explaining how to use a rope system to safely lift such a heavy, long pole. Our biggest issue as a siding contractor is not being able to use the pole jack on top of a roof. 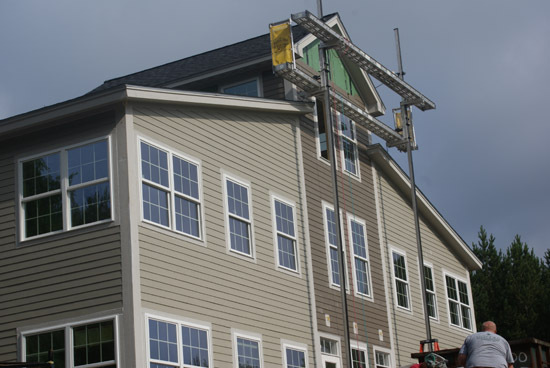 There are many applications on residential construction where this is needed, but no hardware is available to safely mount the bottom of a pole to a roof. We never use aluminum poles for pump Jacks. 2x4s nailed together has always worked fine for use. Only requires a little bit of 2×4 bracing .